Several economists approached NAR late last year with questions about its modeling. NAR economists promised to study the issue during a December conference call that included economists from the Mortgage Bankers Association, Fannie Mae, Freddie Mac, the Federal Reserve, the Federal Housing Finance Agency and CoreLogic. ... Even assuming a high share of all-cash sales, purchase-loan application data suggests that home sales have been overstated by 10% to 15%, said Jay Brinkmann, the MBA's chief economist. "If they are off by this much, this consistently, it would be sending the wrong signal to the market," said Mr. Brinkmann. • The real price indexes are at post-bubble lows. The National index is at a post-bubble low in nominal terms too (not inflation adjusted), and is now back to Q1 2003 prices. Those who argued prices bottomed some time ago are already wrong - and prices are still falling. • I don't expect real prices to fall to '98 levels. In many areas - if the population is increasing - house prices increase slightly faster than inflation over time, so there is an upward slope in real prices. 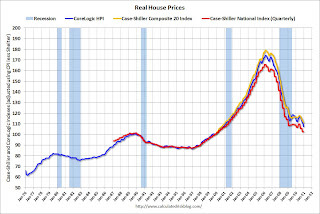 • Prices will probably fall some more and my forecast is for a decline of 5% to 10% from the October 2010 levels for the national price indexes. However we need to watch inventory (and months-of-supply) closely over the next few months - and it doesn't help that the NAR data is questionable.